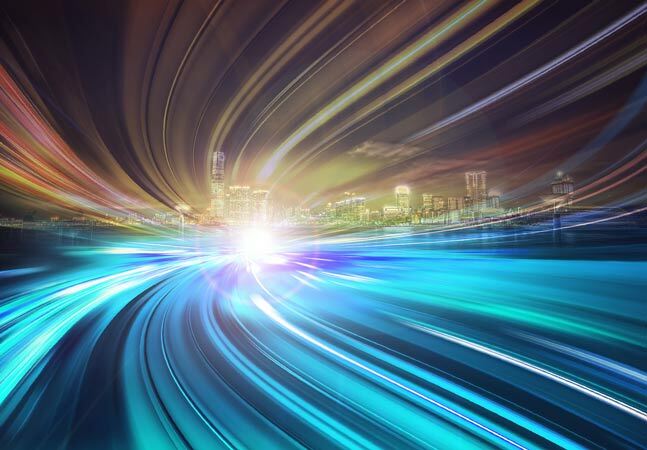 As low-code/no-code, drag-and-drop solutions abound to democratize (or dumb down) development, new niche coding tools are emerging that target ever-more-specific functionality. Increasingly, industry experts and pundits are advocating coding for the masses in the face of a lack of skilled developers to meet an overwhelming demand for mobile apps, Big Data projects and -- coming soon -- to deal with the exploding Internet of Things (IoT). Some say software development should be taught to school students everywhere, just like math and science. Until that dubious strategy is enacted, vendors keep spewing out do-it-yourself solutions. The pitch lines are always the same: "no programming experience required"; "visual, drag-and-drop interface"; "enable ordinary business users to create applications"; and so on. Ancillary to those initiatives, the simplified solutions are becoming more targeted to accomplish single tasks. It's as if the dumbed-down general-purpose programming products are still too complicated and unwieldy, so the multi-purpose aspect is getting winnowed down even further. Now it's use Tool A for this simple, mundane task, and use Tool B for this other simple, mundane task. Could this signify the vanguard of a new direction in software development? Along with microservices, are we going to see more microdevelopment options? Are full-fledged IDEs and development environments going to be relics of the past, consigned to the few big enterprise specialists? Will it be: Goodbye, Visual Studio/Xcode/Android Studio as we know them? Two recent vendor initiatives that recently crossed my desk could be the harbingers of things to come. One builds landing Web pages for mobile apps. The other builds apps for venues or events. LaunchKit, released last week by Cluster Labs Inc., features an Instant App Web Site tool to automatically create companion Web sites for mobile apps in Apple's App Store for iOS apps, because "creating a Web site for your app shouldn't be hard." "LaunchKit's Instant App Web Site tool creates and hosts a mobile-ready, smart solution for anyone who needs to quickly launch a Web site for their app," the company's Web site states. "You don't need to spend days or weeks working on and launching a Web site. With LaunchKit, you just need to fill out a few fields, choose a template, and hit save." Users enter the name of their app into the tool, which searches the App Store to find the app and grabs a bunch of associated data to be used as content for the site, including the app name, tagline, short description, primary color and so on. Users are then presented with a choice of Web site layouts, which can be customized. Once everything is set, the tool generates a site immediately. FierceMobileIT used the tool and reported it "was a cinch to use," generating a site for the publication's mobile app in less than two minutes. TechCrunch reported the tool was "ridiculously easy" to use. While it only works with the Apple App Store for now, support for the Google Play Store is reportedly in the works. If you have an app that isn't in either store, you can use templates to construct your app's Web site with your provided content. The company will host the sites for free, but users will have to go through the work of providing their own domain names. Some things just can't be automated. 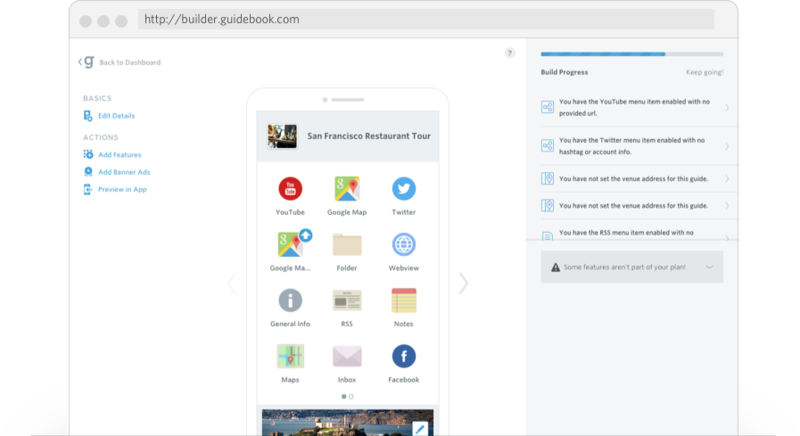 Also new is Guidebook Builder, a tool from another startup called Guidebook, just released Wednesday. 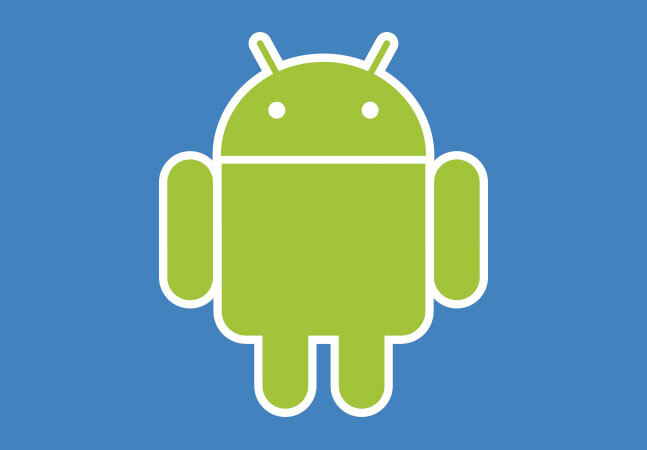 It helps organizations set up mobile iOS or Android apps for specific venues and events. Its marketing materials hit all the right keywords. "Guidebook Builder's drag-and-drop interface empowers people with no programming experience to easily build and manage mobile visitor guides," a company news release states. "Build and publish mobile apps for all types of devices," the company's site states. "Control them in one place with no technical expertise." The company said it started out just for event-related apps, but found users were putting it to new uses, so new functionality was added to keep up, and Guidebook Builder was born. "For example, universities were creating campus tours, and associations were creating membership apps," said CEO and founder Jeff Lewis. "Our new platform will help us keep pace with this demand. 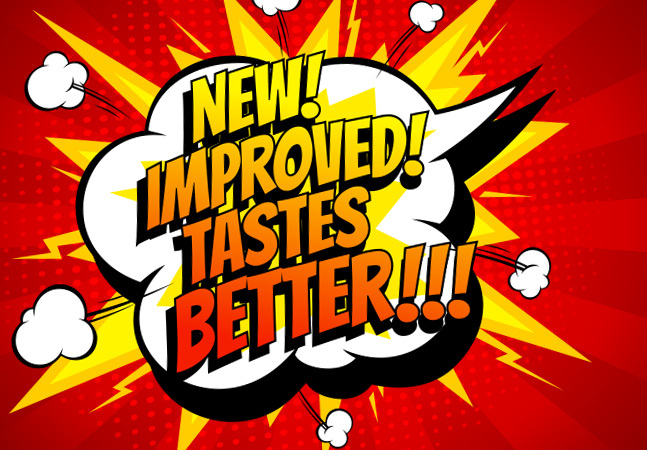 We're investing in new functionality, like location-based video and audio tours, to broaden our customer base, while doubling down in existing areas of focus, like scheduling and mapping, to strengthen Guidebook's offering to our current customers." The tool also features ready-made templates for users to get started with, and the interface guides the development, walking users through the required steps, checking build progress throughout the process and making suggestions along the way. The company said this has been done some 25,000 times in the past two years the original tool has been available. "Guidebook is revolutionizing a mobile app development market largely served by consultancies which offer custom apps for high upfront fees and unpredictable maintenance costs," the company said. 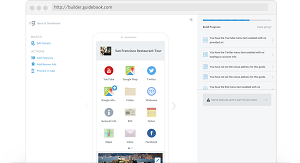 "Guidebook is the only fully functional app builder to offer a free version of its software. The company has lowered the traditionally high barrier to entry in the mobile app space by reducing the time it takes to launch a mobile guide to as little as an hour, and by offering a subscription model which eliminates startup fees and allows customers to predict ongoing costs." And these two tools that just emerged in the past week or so aren't the only niche solutions "revolutionizing" the app development market. HTML5 Maker is an online "no coding required" tool that just builds animations ("You don't even need to have any professional programming or designing skills"). Free Icon Maker does the same thing for icons. Raptivity "is a finely crafted interactivity builder that offers a rich collection of 190+ templates for creating eLearning interactions, quick and easy, absolutely without any programming." And the list goes on. Could all these tools be the start of a new trend that combines with other trends, such as microservices architecture, to transform the way software is developed, with little tools here and there combined with various little services to create big apps? When I'm fooling around in code, I continually have to stop and do a Web search to find out how to accomplish some specific task in whatever tool or language I'm using. With the development times a changin', I can see where I might instead just use some tool to find all the available niche functionalities that I could just plug in to my development process somehow with a few clicks. No highly skilled technical programming expertise or experience needed. It will be interesting to see if programming really gets dumbed down to my level. What do you think of these simplified, targeted development tools? Are there any you find especially useful in your day-to-day development activities? Please share your thoughts here or drop me a line.